These crispy chicken strips are best eaten the same day they&apos;re made, but if you do have leftovers, they&apos;re delicious in sandwiches and salads, too. 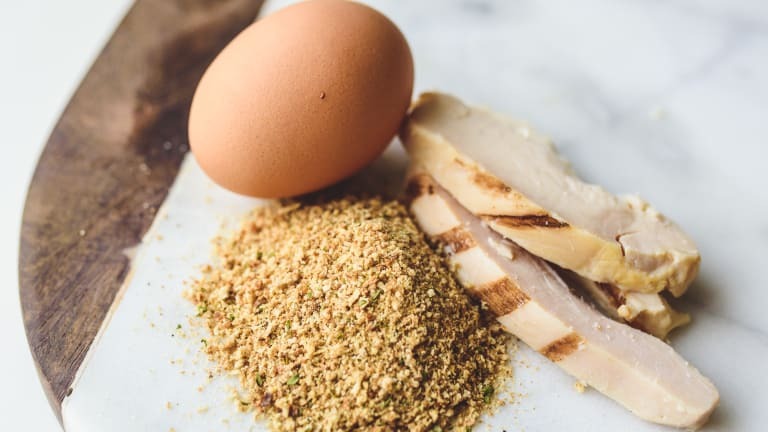 While we recommend using thawed chicken for this recipe, you can cook it from frozen: Follow these directions and be sure to use a meat thermometer to confirm it&apos;s cooked through. Paleo and gluten-free: Omit flour. Substitute Italian-style breadcrumbs for almond meal, 1 tsp oregano, 1 tsp parsley, and 1 tsp garlic powder. 1. Combine flour, salt and pepper on a large plate. 2. In a shallow bowl, whisk eggs until beaten. 3. Spread breadcrumbs on another large plate. Line them up in the order: flour, eggs, breadcrumbs. 4. Prepare chicken: If necessary, slice chicken into thin strips. They can be as wide as you'd like, but should be no more than about 1/2 inch thick. Pat dry with a paper towel. 5. Drizzle olive oil in a large skillet. Set heat to medium. Lay a couple paper towels onto a large plate. 6. One at a time, dip each piece of chicken first into the flour mixture, then the eggs, and finally the breadcrumbs. Each piece should be coated on both sides. Lay gently into pan (be careful; the olive oil may splatter). 7. Cook 3-4 minutes on each side, or until chicken has reached an internal temperature of 165. Lay finished pieces on plate with paper towel; cover with another paper towel while the next batch cooks. Repeat. 8. Serve immediately. Enjoy with rice, over a salad, or on their own.